On March 28th, 2019, in the Bioscience Atrium and Auditorium, Dr. Philip Jessop and his student Sarah Ellis from Queen’s Department of Chemistry will discuss their work using carbonated water in the effort to solve environmental problems. 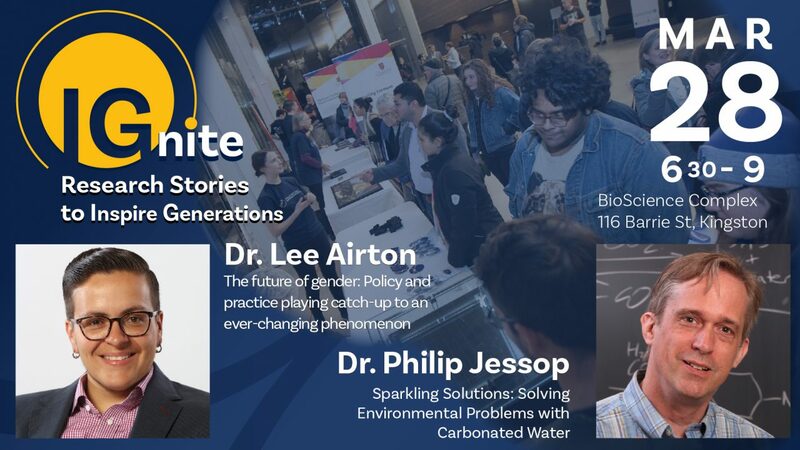 Dr. Lee Airton and their student Jacob DesRoches of Queen’s Faculty of Education will discuss their work on the future of gender and how we approach this ever-changing phenomenon. Together, our speakers will tell you about the unanswered questions that set them on their lifelong quest of research. The evening talks begin at 6:30 and are followed by a reception featuring poster presentations, demos and opportunities to connect with the speakers and others who are doing inspiring research at Queen’s. Click here to see highlights from our last IGnite event on January 31st, 2019.